The Japanese card of the day for April 16th, 2018, is a Double Rare from V-BT01: UNITE! 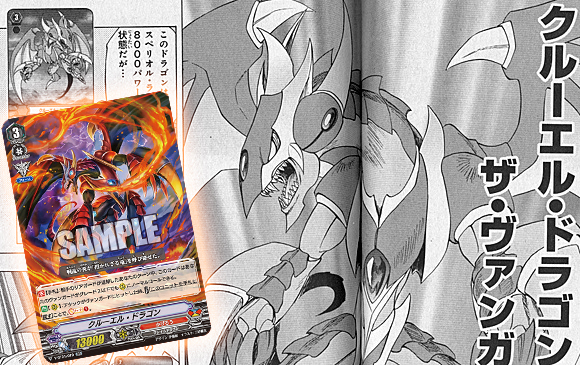 TEAM Q4 and one of Kai Toshiki's key grade 3s from the manga, Cruel Dragon. It's hard not to be underwhelmed. In its original debut, Cruel Dragon was a superior ride Kai used to reach grade 3 faster, and carried the strategic advantage of letting one ride the grade 4 Dragonic Nouvelle Vague in the same number of turns it would normally take to ride a grade 3. In that version, Cruel Dragon was a base 11000 grade 3 that could be ridden when an opponent's rearguard was retired during the main phase, and if ridden this way it would lose 3k power for the turn as a trade-off. It's understandable why Cruel has to be reimagined for Standard format; the new Gift mechanic gives cardfighters another instance of Gift every time they ride a grade 3, and letting Kagerо̄ cardfighters rack up two Gifts in the time it takes the opponent to get just one could destabilize the game. But it would be just as easy to simply not give Cruel Dragon the Imaginary Gift ability, especially seeing as this card already has no vanguard skills. Kai superior riding Cruel Dragon was an important play in the final chapter of the manga's first arc, and beyond that it leaves an open question of just how Nouvelle will be handled by the new series seeing as superior rides are seemingly out of the question. This also means the anticipated synergy between Cruel Dragon and Striken--an important combination focused on in that same chapter--is out the window with it. Adding insult to injury is that the classic game got Cruel Dragon right in Extra Booster 9: Divine Dragon Progression, balancing its superior ride so that you could only do it in the main phase and only if you could successfully rest your grade 2 or greater vanguard. (Not interfering with Megacolony's stand denial mechanics.) 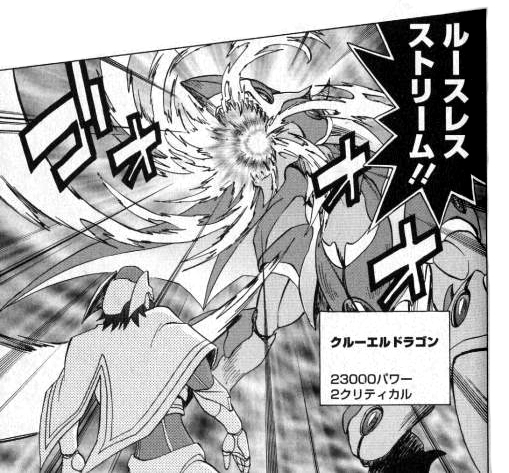 EB09 even gave Cruel Dragon a Limit Break. That said, how best can you use Cruel Dragon? Because his skill is Continuous and not Automatic (e.g. "When your opponent's rearguard is retired...") and specifies "normal call," you can't get any multiple attacks going with Spillover because Cruel can only be called during the main phase. What you can use the card with is either print of Nehalem, to call a powerful rearguard on your grade 2 turn, and to form an early 23k lane with Dragon Monk Gojo. The on-hit skill doesn't inflict much pressure right now, as the only use of the soul Kagerо̄ has is Dragonic Overlord, but with Spillover also filling up the soul it's worth keeping in mind for paying future costs should there prove to be a soulblast theme to the deck. It's likewise worth remembering that you can technically call Cruel Dragon while you're on a grade 1, we just don't have any grade 1 or 0 units that retire cards yet. The intention behind Cruel is likely to attack with it, return it to hand, and ride it again next turn for another instance of Force. 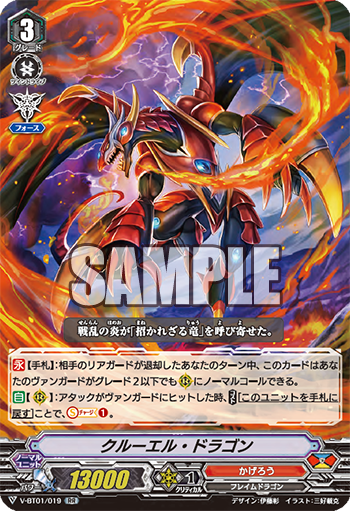 However, seeing as Cruel Dragon's return-to-hand effect is an on-hit skill, there will be plenty of times where you can call this card but shouldn't because you don't have another grade 3 to ride next turn in case the opponent guards. Moreover, once you're on Dragonic Overlord you don't really want to be on any other unit, as his restand skill is too important to Kagerо̄'s gameplan. This is yet another case where replacing "soulcharge" with "countercharge" would have made the card vastly more appealing. Even discounting that, had it been callable during battle phase, Cruel would be much more compelling. 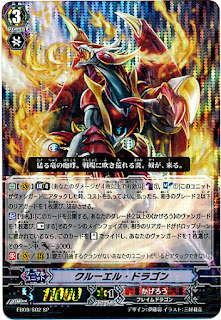 Overall it's hard to recommend Cruel Dragon with what little we know of the current card pool, as Dragonic Overlord, Vortex Dragon, and Crested Dragon are all more appealing units; the only leg up Cruel has over Vortex is possessing the Force ability, and seeing as Crested Dragon's power bonus is both a vanguard and rearguard skill, Crested may be the better choice. When Crested Dragon is an all-around better grade 3 than you, you need to go home and rethink your life. A fearsome general of "Kagerо̄" who swore absolute loyalty to the emperor of Dragon Empire. It is a radical hostile to all who dare complain about the stance of the empire, even among comrades. Its ruthless personality is outshone by its many achievements, among them preventing revolts by dissenting elements. However, it exploits its authority by independently sending out spies and covert units to monitor its comrades, excessively monitoring even those that do not even remark or act against the empire. As a result, many generals censure its excessive actions. Nevertheless, it is a treasure to the empire, and its contribution both in interior and foreign affairs are not to be neglected. The Cruel Dragon roars only once on the battlefield. Its comrades flee as soon as they hear its battlecry. If they do not escape in time, they are incinerated by the turbulent storm of its inferno, as only enemies stand in the dragon's way. Cruel Dragon is designed by Itou Akira and illustrated by Miyoshi Norikatsu, who also illustrated Miru Biru. The previous Japanese card of the day was the Dragon Knight, Nehalem.